STOP CELLULITE fast with resolutionMD from CB Skin Secrets! You CAN treat cellulite effectively, CB Skin Secrets knows how! With resolutionMD, an easy system that improves skin texture, hydration, softness AND reduces cellulite’s ripples and bumps, all with no pain, no down time and no procedure! You will not find a better, easier, faster anti-cellulite treatment AND you won’t find resolutionMD in stores or on line. Click here or go to the appointments page at http://www.CBSkinSecrets.com to make your FREE consultation with Dr. Whitehead to learn more about this and other great products and procedures. My goal is to help you look and feel you best! 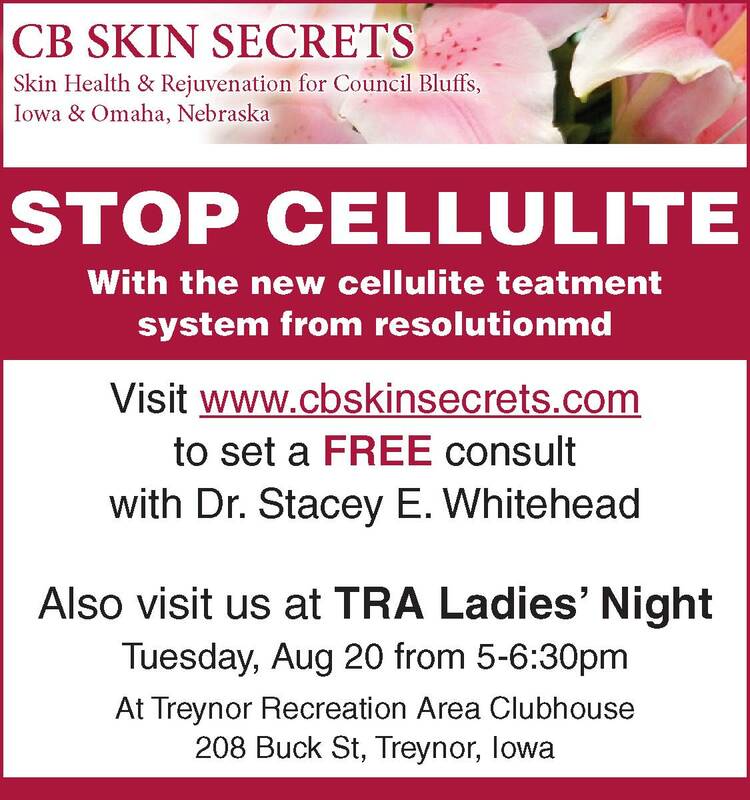 Please stop by Ladies Night at TRA, Treynor Recreation Area clubhouse on Tuesday, August 20, 2013 from 5-6:30pm, 208 Buck St., Treynor, Iowa to hear more! Come see me to see how YOU CAN TREAT CELLULITE! This entry was posted on August 2, 2013, in Events, Skin Tightening with no wound, no recovery, no plastic surgery at CB Skin Secrets, Council Bluffs most complete skin rejuvenation clinic!, Skincare, Uncategorized and tagged cb skin secrets, Cellulite, council bluffs, Dr. Whitehead, iowa, products, rejuvenate, rejuvenation, resolution, skin, Whitehead. Bookmark the permalink.